Ancient flying machines have long been a tradition of many cultures across the globe. Venerable Hindu texts such as the Ramayana and the Mahabharata describe airships called Vamanas that were even used for battle. Among the hieroglyphs on the wall of a 3,000 year-old Egyptian temple at Abydos are depictions of what appear to be modern airplanes and helicopters. Grooved stone discs found in caves on the Chinese-Tibetan border tell of an extraterrestrial race called the Dropas whose spacecraft fell to Earth 12,000 years ago. The Hopi Indians have inhabited three large mesas in northern Arizona for over a thousand years. Their legends also refer to aerial vehicles, perhaps from Orion. These magical flying shields called paatuwvota existed in the Third World, a previous epoch destroyed by an immense flood. This was a time when great cities and trade routes were built, and civilization was flourishing. 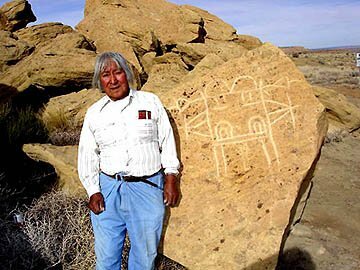 In an address delivered to the United Nations, Thomas Banyacya of the Hopi Coyote Clan said: “The people invented many machines and conveniences of high technology, some of which have not yet been seen in this age.” We, of course, recognize this startling description as echoing Atlantis. In one legend the flying shield is associated with Sotuknang, the Hopi sky god. Apparently a devastating flood had destroyed Palatkwapi, “the red city to the south” possibly located in the red rock country near Sedona, Arizona. Shortly afterwards a brother named Tiwahongva and his sister Tawiayisnima, who were forgotten in the chaos and left behind by their fleeing parents, set out on a journey to find them. 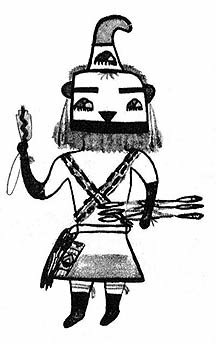 Hopi drawing of the sky god Sotuknang. He then took them on his flying shield up into the sky so that they could see for many miles around. Feeding the hungry children ripe melons, he told them that they must have faith in him and in his teachings that would later arrive through their dreams. Finally he landed a short distance from the village in which their mother and father had settled, bid the young ones farewell, and flew up again into the clouds. Forever grateful to the sky god, the brother and sister walked into the village to be reunited with their parents. Since the Hopi term paa means ‘water’, paatuwvota possibly refers to the expanding concentric rings in water. This might be a metaphorical description for the way the peculiar airborne device appeared to function. The related word patuka, or ‘spindle’, may also describe the shield’s spinning motion. In addition, the prefix pa– denotes wonder or awe. For the people of the desert, water equals wonder, but pa– perhaps suggests the reaction to this extraordinary means of transportation. The tradition of the flying shield also appears in rock art. 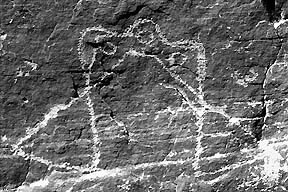 The photo below is of an ancient petroglyph, or rock carving, found near Winslow, Arizona, apparently showing a triangular craft. Petroglyph of a delta-winged spacecraft? Some readers may be familiar with the wooden kachina dolls that the Hopis carve. (See photo.) 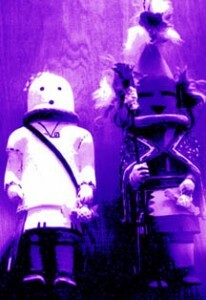 Kachinas are not gods per se but spirits that act as mediators between gods and humans. They may take the form of any animal, plant, celestial body, or otherworldly creature. During the spring and early summer the Hopis perform a ceremonial cycle of masked kachina dances as a plea for rain and the general well being of the tribe. Eototo, chief kachina (left) and Aholi, his lieutenant. Hopi kachina dolls at Museum of Northern Arizona. The more correct spelling is katsina. The Hebrew word for “officer” in the Bible is katsin. 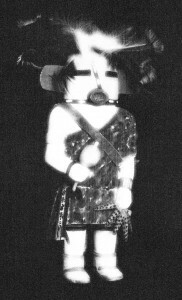 Much like the fallen angels (or the Watchers) of the Bible (see Genesis 6:1-4), the kachinas were sometimes known to mate with Hopi women. This prefigures the contemporary theme of alien abduction for the purpose of reproduction. One Hopi myth tells of a young bride who accompanies her handsome Kana kachina husband back to her Second Mesa village of Mishongnovi on a flying shield. As the entourage advanced from the ‘kachina’ peaks toward Second Mesa, it bore a huge quantity of corn and melons on their backs as gifts for the Hopis. This diverse group of divine messengers must have been a stunningly beautiful sight. In fact, the Hopis sometimes refer to kachinas as ‘the beautiful creatures.’ This designation emphasizes not only their esthetically pleasing appearance but also their role as actual entities in a kinship system. Long ago the kachinas were adopted into the clans along with various plants and animals during the migrations that took place after the Hopi emergence from the Underworld — the Third World previously mentioned. Their presence had clearly been physical or tangible as opposed to supernatural or ethereal. In other words, their influence was once felt directly on a material level. As time went on, however, social and religious corruption — a recurring motif in Hopi thought — forced these bizarre but benevolent ‘people’ to abandon the American Southwest. From that period to the present, kachinas appear for the most part only in their spirit forms. Some Hopis believe that kachinas still maneuver these mysterious aircraft. In his book The Terra Papers, the Hopi/Apache author Robert Morning Sky describes how his grandfather and five other men were camping in the desert in August of 1947, shortly after the infamous Roswell incident, when a flying disk streaked across the night sky and crashed. From the wreckage they recovered a silvery alien, unconscious but still alive, whom they named the Star Elder. After they nursed it back to health, the ET then telepathically described by means of a crystal the galactic war raging above which had downed its spacecraft. This X-Files material with a Native American twist remains unconfirmed. Unexplained sightings continue, however. In the summer of 1970 hundreds of UFOs were seen about 125 miles southwest of the Hopi villages near the town of Prescott, Arizona. On the evening of March 13th, 1997 in the same vicinity a delta-winged craft perhaps as large as a mile across with lights on its leading edges was spotted drifting silently overhead before speeding off toward the south. 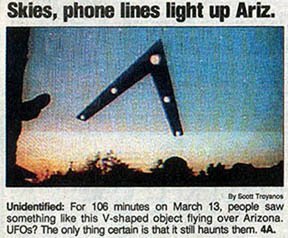 It later became known as the Phoenix Lights. USA Today headline, June 18th, 1997. In 1998 the radio talk-show host Art Bell interviewed two Hopi elders who stated that their very distant ancestors knew how to travel to other planets. They also said that during the End Times, we would be visited by ‘people outside’ the Earth who have an advanced technology. 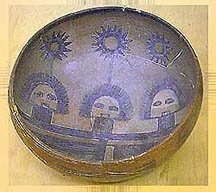 Trio of star elders, ceramic bowl, northern Arizona. Many Hopi wisdom keepers believe that the increased presence of flying shields signals the end of the Fourth World, or our current era. In conjunction with Biblical prophecies of the apocalypse, the kachinas or star elders may be trying to warn us of this dire state of affairs. By listening to these entities throughout the ages, the Hopis living on their isolated mesas have long known the global fate that now seems imminent. Some of the signs and portends are in the skies. We need only look up. 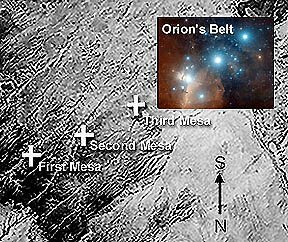 The three stars on his crest may represent Orion’s belt. Copyright © 2008 by Gary A. David. All rights reserved. Gary A. David is author of The Orion Zone: Ancient Star Cities of the American Southwest (Adventures Unlimited Press, 2006). Mr. David’s new book Eye of the Phoenix: Mysterious Visions and Secrets of the American Southwest is now also available from the usual outlet.